What Can You Cook on a Pellet Grill? You may have heard of pellet grills and wondered what all the hype is about. It’s just a grill, right? What can you cook on a pellet grill that you can’t on a propane grill? Plenty, my friend. In fact, there are a few foods you simply haven’t experienced unless you’ve cooked them on a SmokePro pellet grill. These pellet grill recipes are here to change your life. Or, at least, your taste buds. First on our list of what you can cook on your pellet grill is frozen, store-bought chicken. You know that cheap, rubbery kind you have to excavate from out of the frozen aisle? Yeah, that’s it. Well, now you can make a delectable dinner of it every week. 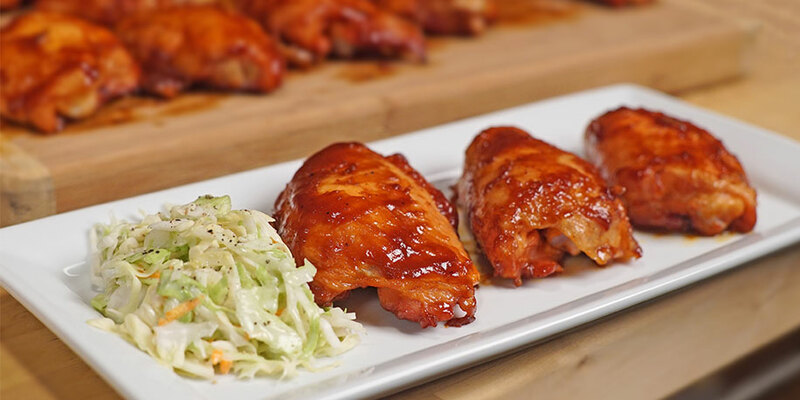 Just place the frozen chicken directly onto the grates of your pellet grill, turn the temperature dial to Hi Smoke, and let the smoker do its thing for an hour. When you come back, you’ll want to season the chicken with steak seasoning and bring it to an internal temperature of 165° F (we can help you measure the internal temp). If you plan to finish it off with a sear, you can transfer it to your sear box when it reaches 130° F. Either way, you will have turned border-line inedible chicken into a tender, flavorful piece of protein. If you’re looking to upgrade from frozen chicken, this chicken recipe is the way to go. The total time to make it, start to finish, is only 30-45 minutes. You could be looking at a prize-winning dinner in no time. What can you cook on a pellet grill? A dang good burger. I know what you’re thinking: burgers and propane grills go together like cheesy potatoes and Dutch ovens. But the added wood-fired and smoky flavors you get from a pellet grill will give you a burger unlike any other you’ve tasted before. There are two approaches to how to cook your burgers on a pellet grill. Heat First, Smoke Later First crank the pellet grill to high and let it warm up for 10 minutes. Cook your burgers on that setting for 4 minutes on each side, then finish up on the High Smoke setting to slowly smoke it to your desired temperature. You won’t get the same seared finish that you might on a propane grill, but you’ll be too busy enjoying the smoky flavor to notice. Reverse Sear If you need a good sear to fall in love with a burger, you can use the SmokePro sear box for the reverse sear method. You begin with the burgers on medium heat in the pellet grill—about 275° F—to give the meat two layers of smoky and wood-fired flavor. You’ll also want to switch on your sear box to medium and let it heat up for 5 minutes. I’ve found that medium is hot enough for the kind of sear I like, but the unit can heat up to 900° F. Once the burgers start to sweat a bit, I like to move them to the sear box. Leave them for 1 minute, rotate 90° for 1 minute, then flip and do the same on the other side. For me, the combination of the seared texture and the wood and smoke flavors is hands down the best way to cook a burger. This is the best pulled pork recipe I’ve ever tasted. I like to bring my meat up to 205° F so that it just falls apart with a fork. There’s no going wrong with a low-cost, high-volume BBQ meal like this one. And with a pellet grill, it takes almost no effort on your part. No recipe needed for this one. Just buy bacon, throw some Competition Blend pellets into the hopper, and experience the miracle of pellet grill bacon. Low and slow is good, medium heat is good, high heat is good. It’s almost impossible to mess up. If you’ve ever wondered, “What can I cook on a pellet grill?” this should be the first thing you try. There is no better way to cook ribs than on a pellet grill. Period. Don’t believe me? Try this incredible ribs recipe this weekend and taste it for yourself. Of all the cuts of meat, brisket is among the most intimidating to cook. There’s trimming, wrapping, rubbing, and then hoping it doesn’t turn out dry and disappointing. I’m nowhere near a pit master, but I’ve cooked brisket several times now on my SmokePro, each time with great success. Check out this smoked brisket recipe for your next big barbecue, and keep an eye out for more tips and tricks coming soon. So maybe you’re feeling a bit daring, and you want to try something unique. What can you cook on a pellet grill that isn’t meat? Give this classic American dessert a shot. You can use our favorite apple pie recipe or your own, then leave it on your pellet grill to bake. Set the grill to 400° F just like you would a kitchen oven, and that’s it. Don’t worry—it won’t taste smoky. In fact, I suggest using apple pellets for a sweet, Applewood flavor. Your neighbors might give you weird looks as you put your pie on the grill, but it will be worth it.